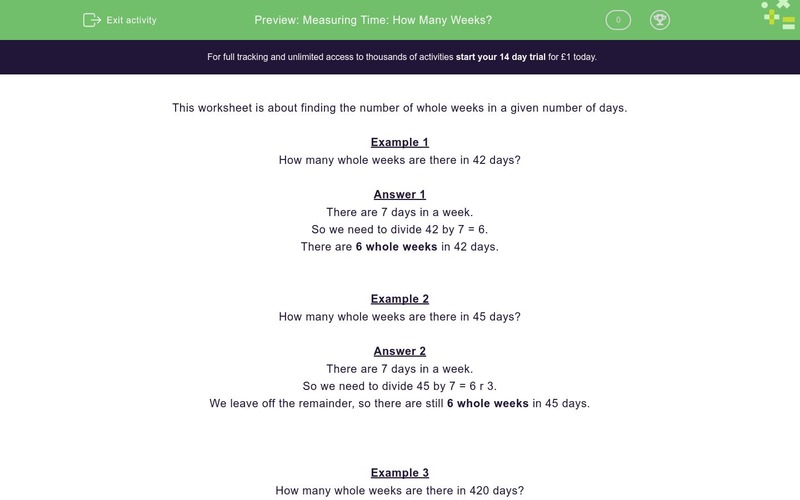 In this worksheet, students must calculate the number of whole weeks from a given number of days. This worksheet is about finding the number of whole weeks in a given number of days. How many whole weeks are there in 42 days? So we need to divide 42 by 7 = 6. There are 6 whole weeks in 42 days. How many whole weeks are there in 45 days? So we need to divide 45 by 7 = 6 r 3. We leave off the remainder, so there are still 6 whole weeks in 45 days. How many whole weeks are there in 420 days? There are 60 whole weeks in 420 days. How many whole weeks are there in 30 days? How many whole weeks are there in 32 days? How many whole weeks are there in 56 days? How many whole weeks are there in 62 days? How many whole weeks are there in 75 days? How many whole weeks are there in 77 days? How many whole weeks are there in 700 days? How many whole weeks are there in 701 days? How many whole weeks are there in 707 days? How many whole weeks are there in 351 days?